Conti tackles Rhythm Changes; this one’s a burner! 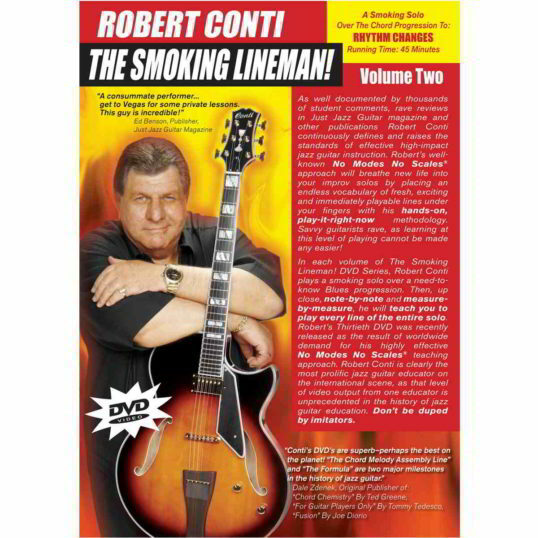 Just received my first order from You, the Smoking Lineman DVD. Wow, that was delivered quickly. I have to say the DVD is absolutely stunning. Bob’s playing and teaching is just great. He really can make things look so easy. Best teaching product ever! 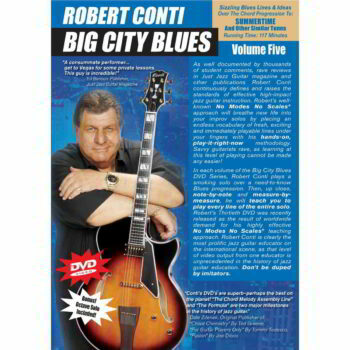 I can really attest to the excellence and effectiveness of Robert Conti’s method. I have never progressed this fast in my 20 plus years of playing. I was so excited with finally getting measures 20 through 28 of the Smoking Lineman “Changes” under my fingers that I got up at 4 o’clock this morning to work on morphing these lines into my own style. On the “Changes” DVD Robert says, “remember to start thinking about and playing lines and quit trying to think of different scales or patterns for each different chord.” Somehow we all know this is what we’re supposed to be doing but it is so tempting to over-think a progression and turn it into a technically correct but musically nightmarish flurry of notes. Lines. WOW. What a fluid and musical approach. Since I received my first DVD and lesson from RC, I bring my guitar to work everyday so I can play during lunch. I simply can’t make it from my morning practice through the entire day. It is that exciting! Thank you, Robert, for all the hours of enjoyment and for the excellent example and teaching. Blessings to you and your fine team! I am really impressed with Robert Conti’s ability and teaching. I wish I had discovered him some time ago. 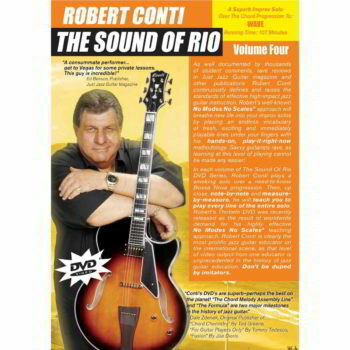 I will certainly be ordering more improv DVDs and chord melody books in the coming weeks.